Course 3!!! It was wedding tiered cakes and fondant. This course, we got to make 2 cakes. The first one was a present cake. We learned how to cover a cake with fondant and make other fun stuff like the ribbons and bows. 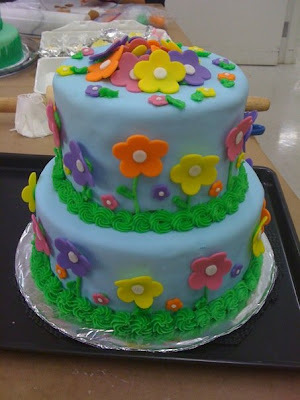 I remember feeling frustrated while covering my cake with the fondant. It wasn't easy at all but practice makes perfect. Know you know why bakeries charge so much for cakes!! It's a lot of time and effort and not forgetting Patience!! For the cake, it was a yellow cake with raspberry jelly. Here's the final cake! I decided not to do wedding cake only because my husband was going to take this cake to work. Instead, i wanted to do something more fun and went with this. i pre made the flowers at home since they needed to be cut out and placed in flower formers to curl up. 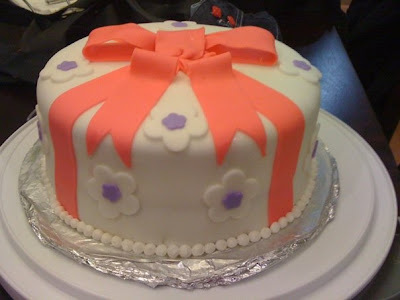 The cake turned out good but i my fondant tore a little while i was covering the cake. i covered most of it up with the flowers so it wasn't to bad. Like i said, practice makes perfect and i have gotten better at covering my cake:) The top tier of this cake was a butter cake with blackberry jelly and the bottom tier was chocolate with blackberry jelly. Up next, Fondant and Gum paste. And for that, you'll have to wait till next week. Not sure yet what I'm going to do with my final cake but I'm sure I'll figure something out soon!